Developing and using digital technologies will be the central theme of Deutsche Bahn's (DB) exhibition at the InnoTrans 2018 trade fair in Berlin from 18 to 21 September. DB is showcasing new solutions for tackling the constantly growing demand for mobility and the challenges associated with this. These challenges include shortage of road and parking capacity in urban areas, increasing commuter traffic, particulate pollution and climate protection. "At our exhibition booths, visitors can find out how new technologies are taking the rail system to a new level of performance. When trains, maintenance facilities and control-command and signalling constantly exchange data, and sensors monitor the condition of our points and trains, we will be able to expand rail services and make them even more attractive," says Dr Richard Lutz, Chairman of the Management Board and CEO of Deutsche Bahn. With the theme "/moving mobility:next level", DB is using the trade fair to showcase its services and new digital applications, which range from artificial intelligence to blockchain, virtual reality and 3D printing. More than 20 exhibits at the DB stand will invite visitors to familiarise themselves with new digital technologies and put them to the test. Six themed areas will inform customers, partners and researchers about innovations and shared achievements: Infrastructure, Digitalization & Technology, Training & Jobs, Procurement, Passenger Transport, Freight Transport & Logistics. DB Bahnbau Gruppe will also be represented in Hall 25 at booth 310. On Wednesday 19 September, the DB booth will be putting the Digital Rail for Germany programme in the spotlight. DB CEO Dr Richard Lutz and DB Board Member for Infrastructure Ronald Pofalla will provide a detailed insight along with Guido Beermann, Secretary of State in the Federal Ministry of Transport and Digital Infrastructure (BMVI). The aim is to boost capacity on the German rail network by up to 20% using digital infrastructure without the need to construct new lines. At the outdoor exhibition area (south entrance), the DB Regio subsidiary will present the Ideas Train at a trade fair for the first time. On board a full-scale model of a double-decker coach, today's visitors will be able to see what tomorrow's regional transport might look like. From relaxation seats to mobile working areas and a rolling fitness studio, the Ideas Train reflects the ever more individualised needs of customers. The modules provide a flexible package, enabling new customer-related ideas to be incorporated into contract award procedures. 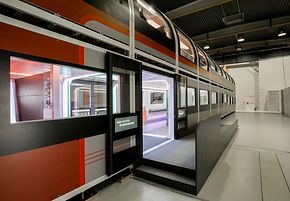 On Thursday 20 September, DB and Siemens Mobility will sign an agreement on board the Ideas Train to cooperate on accelerating implementation of the train's innovative prototypes in regional transport. DB will still be represented outdoors (tracks O/608, O/600, 6/410) by the Regio, Systemtechnik and Fahrzeuginstandhaltung Business Units. DB Services and DB Security will also be present. The new class 484 for the Berlin S-Bahn will be on show on track 10/400. DB will welcome visitors not only with its exhibition spaces but also with an exciting programme of interesting events. The international Rail Leaders' Summit organised by DB and others will take place on the opening day (Tuesday 18 September) with the theme "RAILtropolis – The future of cities is rail". Also on Tuesday, the Group Management Board will help present the DB Supplier Award to the best partner companies. On Thursday 20 September, the DB Innovation Forum will look at the challenges of digitalisation in the industry and the resulting new opportunities for collaboration. Professor Sabina Jeschke, DB Board Member for Digitalisation and Technology, will open the presentation- and discussion-packed event with representatives from business and research. Mobility Talks on mobility and digitalisation will take place for visitors on every day of the trade fair. An overview of the full DB trade fair programme and a selection of the most important exhibits and innovations is available at DB Mediaportal Daily photos from DB's exhibits and events can be downloaded straight from the media page.